Afghanistan's National Air Corridor Program may not be sustainable, and gaining access to the Karachi port should be a priority for the Afghan government. Afghanistan has long been suffering from what Paul Collier describes in his book The Bottom Billion as a “landlocked trap”—a landlocked situation with bad neighbors. Afghanistan’s lack of direct access to the sea and a capricious political relationship with neighboring Pakistan has marginalized the country from the international trade network, thereby hampering economic growth, surging unemployment, and proliferating poverty. In recent years, Afghanistan has experienced a sharp decline in economic growth. The GDP growth substantially dwindled from 14.5 percent in 2012 to 2.6 percent in 2017, resulting in staggering 40 percent unemployment and 36 percent poverty rates. Its trade deficit, spurred by an extremely low export volume (6 percent of the GDP in absolute terms), has been growing substantially—jumping from 31.6% of GDP in 2016 to 33.6 percent of GDP in 2017. Pakistan has remained Afghanistan’s largest trade and transit partner for decades. The aggregate trade between the two countries peaked at $2.7 billion during 2014-15. Afghan traders have used Pakistan as a route to access the gigantic Indian market. However, in the past few years, due to a turbulent political relationship between the South Asian neighbors, Pakistan has imposed several superfluous regulatory barriers to trade and shut down the Chaman and Torkham borders on multiple occasions. Such policies plummeted Pakistan’s trade relationship with Afghanistan—reducing the bilateral trade to $500 million—and impeded Afghan traders’ access to the Indian market. Thus, it was imperative for the Afghan government to diversify its trading partners and abrogate Pakistan’s intrusive impact on trade with India. In June 2017, the Afghan government launched the “Afghanistan-India Air Corridor” as a pilot project to facilitate trade between Kabul and New Delhi via air freight. “Our goal is to change Afghanistan to an exporter country. Unless we are an exporter country, poverty and instability will not be eliminated”, said Afghan President Ashraf Ghani during the launching ceremony. 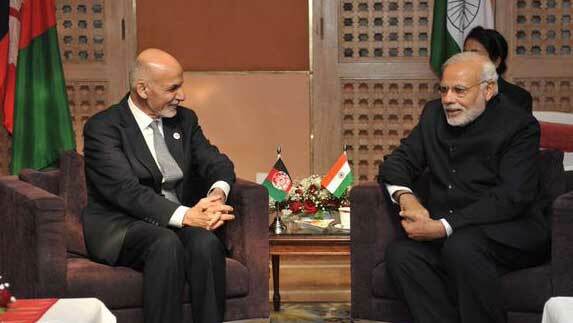 Since then, Afghanistan has exported 3,318 metric tons (MT) of goods through 155 flights to the Indian capital. The Special Inspector General for Afghanistan Reconstruction (SIGAR) reported a 28 percent increase in Afghan exports from 2016 to 2017, crediting it largely to the initiation of the air corridor program with India. Following the success of the first air corridor project, the Afghan government expanded it at an impressive rate to several other countries, framing it as “National Air Corridor Program”. So far, the program has facilitated export of 3,643 MT of goods worth $63 million through 244 flights to international markets, including India, Turkey, Saudi Arabia, European Union, Kazakhstan, and UAE. These include perishable and non-perishable goods, such as dry fruits, fresh fruits, medical herbs, handicrafts, and carpets. As a result, Afghanistan’s air exports have grown from $230 million in 2015 to $391 million in 2017, marking a 70 percent increase in two years, according to SIGAR. On Nov 07, 2018, Afghanistan opened a new air corridor with China dispatching 20 tons of pine nuts (worth $500,000) to Shanghai. During the inauguration ceremony, Afghan President Ashraf Ghani said, “Pine nut, pistachio and cumin are the hidden treasures of Afghanistan, and the government is committed to bring out its full potential via trade corridors.” It is estimated that Afghanistan will export approximately 2,000 MT of pine nuts to the Chinese market annually. The Afghan government also signed an MOU with the Turkish Airline to transport other commercial merchandises, such as vegetables, rugs, minerals, handicrafts, and animal products, to Shanghai, Beijing, and Guangzhou. Export via air corridor carries some financial costs for the Afghan government, on the other hand. In an attempt to make air transportation more affordable for the businesses and make Afghan products competitive in the international markets, the government provides 80 percent subsidy in the shipment costs, aggregating to $2 million to date. However, the air corridor program is still nascent. As it expands and larger amounts of merchandises are exported, the financial burden on the government could be overwhelmingly high. For instance, Ajmal Ahmady, President Ashraf Ghani’s senior economic advisor, recently tweeted, “We estimate the value of pine nuts to be ~$10k/MT in Kabul and ~$20k/MT in China. This means the total value for 22MTs is $440k (using end market prices). By comparison, shipping costs are relatively low at ~$3k/MT, or $66k for all 22MTs”. With the current subsidy rate, the government would need to contribute more than $17.5 million annually merely for 2,000 MT export of pine nuts to China. Though the National Air Corridor Program is a “win-win” option for both the government and private sector at the status quo by offering faster, more secure, and more reliable mode of shipment in the immediate term, it might not be a viable alternative in the long term due to the high cost of air freight. The US government recently exempted the development of the Chabahar port from the new sanctions imposed on Iran under the Iran Freedom and Counter-Proliferation Act of 2012. Thus, in the long term, Chabahar port will open a new transit route for the Afghan businesses to transport goods to India and other international markets via sea route. The Afghan government should also leverage Pakistan’s recent commitments to ease trade and transit for Afghan traders. Hence, providing Afghan businesses with access to the Karachi port should be a priority for the Afghan government.